MCLEAN, Va. – 2012-12-19 — /travelprnews.com/ — DoubleTree by Hilton today announced the opening of the newly renovated, upscale, full-service, 177-room The Emily Morgan San Antonio – a DoubleTree by Hilton. The hotel is owned by Alamo Hotels, Inc. under a franchise license agreement with a subsidiary of Hilton Worldwide. The hotel is managed by Westmont Hospitality Group. Renovations have been completed in all areas of the hotel with rustic design elements chosen to reflect the hotel’s historic location at the site of the Alamo. Guest rooms feature new carpeting, window treatments, furniture and bedding, and bathrooms were redone in their entirety. Public areas and meeting spaces have been upgraded with new carpet, lighting and wall coverings, including stone work lamps, metallic frames and natural wood elements. Guests of The Emily Morgan San Antonio – a DoubleTree by Hilton enjoy the brand’s signature benefits found at more than 320 DoubleTree by Hilton locations in 25 countries around the world, including the warm chocolate chip cookie presented to every guest at check-in, an array of upscale amenities and guest services, the rewards of the Hilton HHonors guest loyalty program, and a unique and caring team member commitment to the local community. The tastefully appointed guest rooms at The Emily Morgan San Antonio – a DoubleTree by Hilton feature bright décor and modern comforts and conveniences. Rooms provide a single king size or two queen beds; granite bathrooms; mini-fridge; spacious work desks with ergonomic chairs; large screen, high-definition, LCD TVs; MP3-compatible alarm clocks; plush Sweet Dreams® by DoubleTree Sleep Experience; Wolfgang Puck in-room gourmet coffee and tea service; and CITRON by Crabtree & Evelyn bath and body products. Complimentary high-speed internet access is available throughout the hotel. The Emily Morgan San Antonio – a DoubleTree by Hilton can accommodate business and social events in 4,500 sq. ft. of flexible meeting space. The hotel also has a 24-hour business center and complimentary printing service that includes “print-from-your room” convenience. For guests who wish to keep up with their workout program while on the road, a newly renovated, state-of-the-art, fitness center and year-round outdoor swimming pool and whirlpool are available. The hotel’s onsite restaurant, ORO Restaurant and Bar, features regional Texan cuisine, complimented by seasonal dishes served in a relaxed atmosphere. The restaurant serves the brand’s signature Wake Up DoubleTree Breakfast, which includes hot entrees and healthy options to start the day right. At the end of a busy day, guests can unwind with a fine selection of refreshing cocktails in the restaurant’s stylish lounge. Room service also is available during peak dining hours. Located opposite from The Alamo in the historic downtown area, The Emily Morgan San Antonio – a DoubleTree by Hilton is situated just minutes from the city’s world-famous Riverwalk. The hotel is easily accessible to the San Antonio International Airport, Stinson Municipal Airport, and Interstate highways 10, 35 and 37. 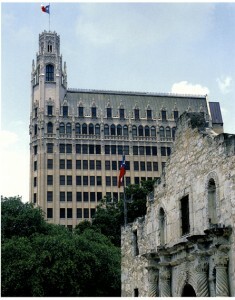 The DoubleTree by Hilton is located at 705 East Houston Street, San Antonio, Texas 78205. For more information, please visit www.doubletree.com, contact your preferred travel professional or call +1 800 222 TREE.